The veloster mats are made of really hard rubber. They seem pretty solid and should last the life of the car. They are heavy duty! I went with rubber only over carpet, as I thought it would be easier to clean and they were 30 bucks cheaper. There is a deep recession design so dirt and melting snow will be trapped and kept away from the floor carpet. The two front mats display veloster across the middle and is nicely designed and good looking. 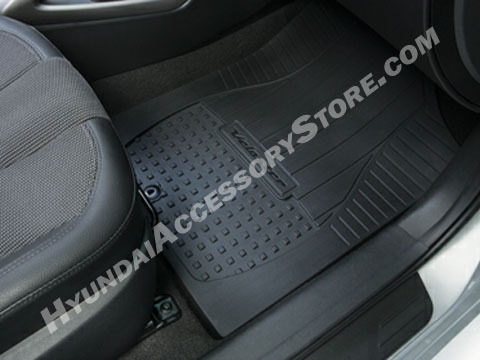 The two rear mats do not say veloster. All four mats are custom fit for installing in a specific spot. They are configured well, and cover a large area. The fit is good and tight, while avoiding bulky bumps. One thing I would like to point out is that these mats do not slip. As the veloster is low to the ground, when you get out, your right foot tends to "push off" for balance. The mats hold tight to this pressure and don't slide about at all. This is an important selling factor in my opinion. Purchasing them online here saved me 30 bucks + tax. I do not recommend these mats. They are raised up (sort of platformish)....and the dirt and debris from my shoes tends to fall onto the sides of the mats instead of being caught within. I wish I would have spent the extra money and gotten the all weather tech mats.